It is vitally important for any media portal to be online nowadays. Even most popular media have a website. And if you want to even up the score with them you need a professionally developed website. 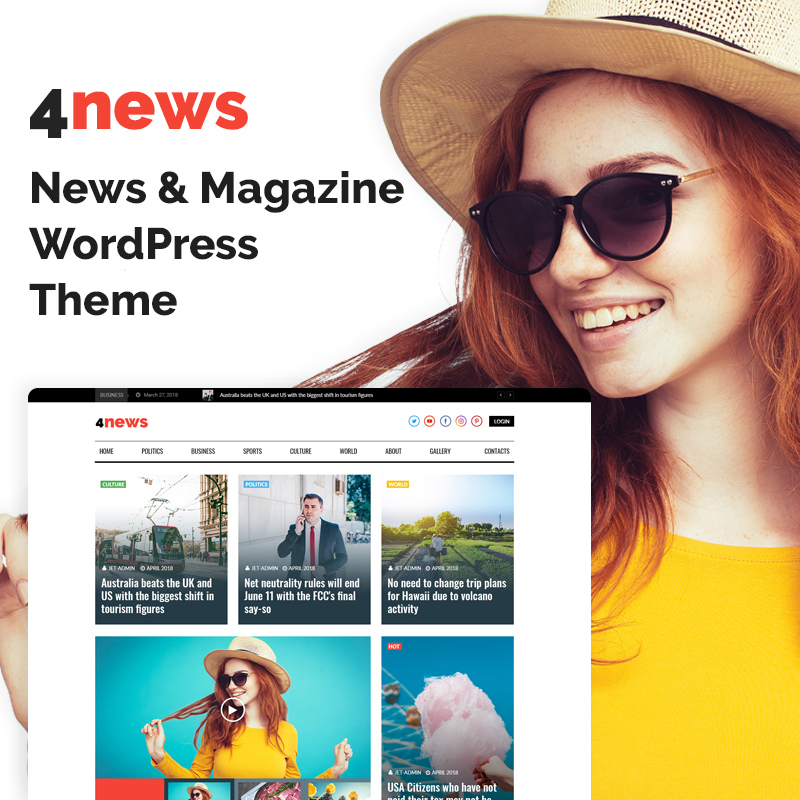 Yet, in case you do not want to pay extra money for web development you can purchase one of pre-built WordPress news themes. They are top-notch products with well-developed design, structure and many included features. Just check the products page to see all the features and check the demo. Pablicon is a great choice for any media. It has a clean design and it is well-structured. Publicon has various pre-built pages you can fill with information. 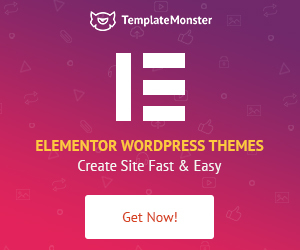 Moreover, you can edit all parts of a website with Elementor page builder and you need no HTML or CSS skills. It is also vitally important for any media to be responsive. 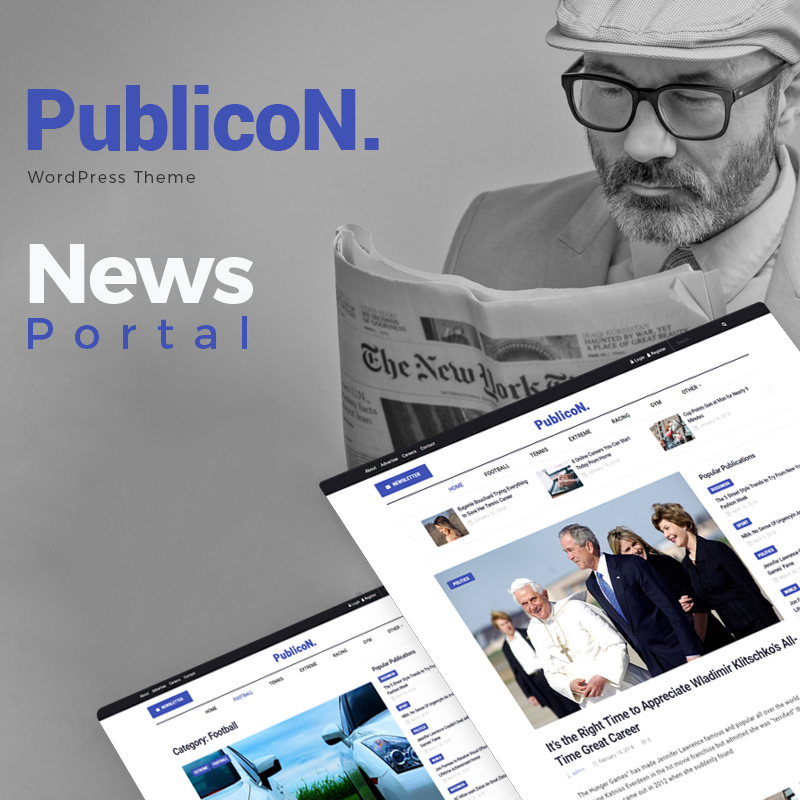 Publicon is one of the most responsive themes and it works without issues on any device. Just check the demo to see more. Sometimes you need a tool for various types of media. If you want to save the money and purchase one tool for all occasions, then you need a multipurpose media portal. And we have a web development tool for all news portals. 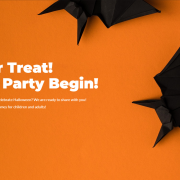 24.Storycle is a fully-editable theme with various effects and elements you can use to decorate your website. IT includes Elementor drag-and-drop builder, Mega Menu builder, header and footer builder, and many more features. It also includes premium Jet Plugin package and 24/7 support team service. Developed specially for news websites this theme has an eye-catchy and clean design with many visuals you can use to change and improve your website design. Due to developers hard work, it includes a valid code and many useful features. For example, it has a mobile-first paradigm that makes your website fully responsive and cross-browser. It also has pre-built pages you can use for various occasions. 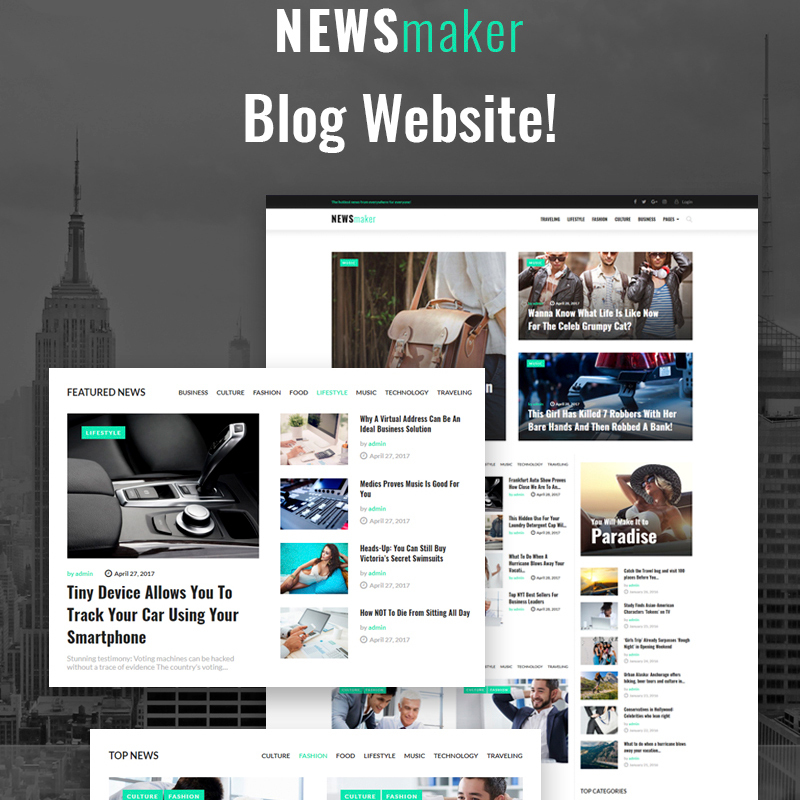 It even has useful giveaways You can rely on Newsmaker and use it for your project. 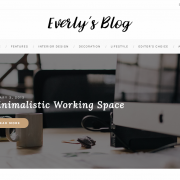 If you are a blogger then you need a website too. A personal website is a place when you can post, upload videos, create a place for your community and set your own set of rules. Yet, you need a professionally designed and structured website template. 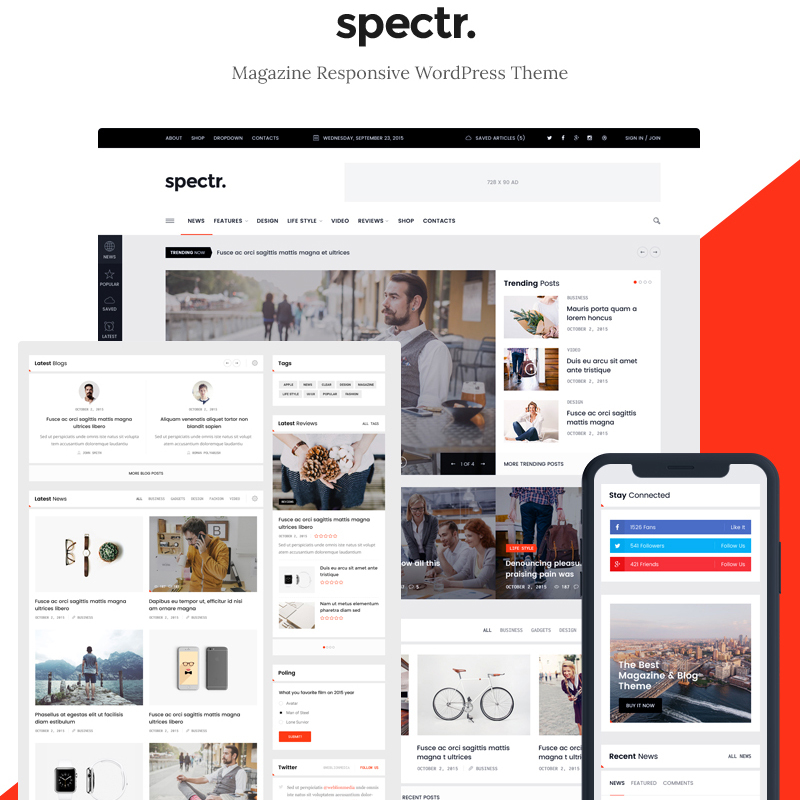 Like Spectr WordPress theme. It is fully responsive and fully customizable, includes video posts, audio posts, and various blog posts and formats. In addition, it has a clean, yet elegant design and you can highlight the most important information. For modern news and magazines, it is important to have a fully-functional and attractive website. It is important because online media are the most popular media type nowadays. 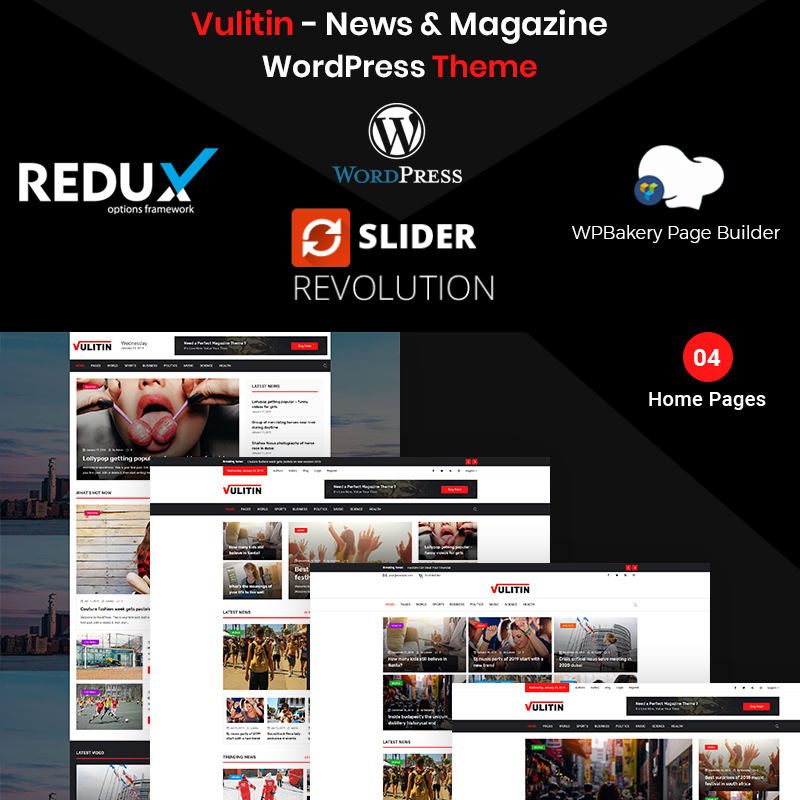 And if you need a well-developed website for a good price then you need Vulitin WordPress Theme. It is well-documented and SEO-friendly theme. Moreover, it is professionally designed. Due to these features, your online magazine will be easy to read and decorate. In addition, it will be in the top web search results. 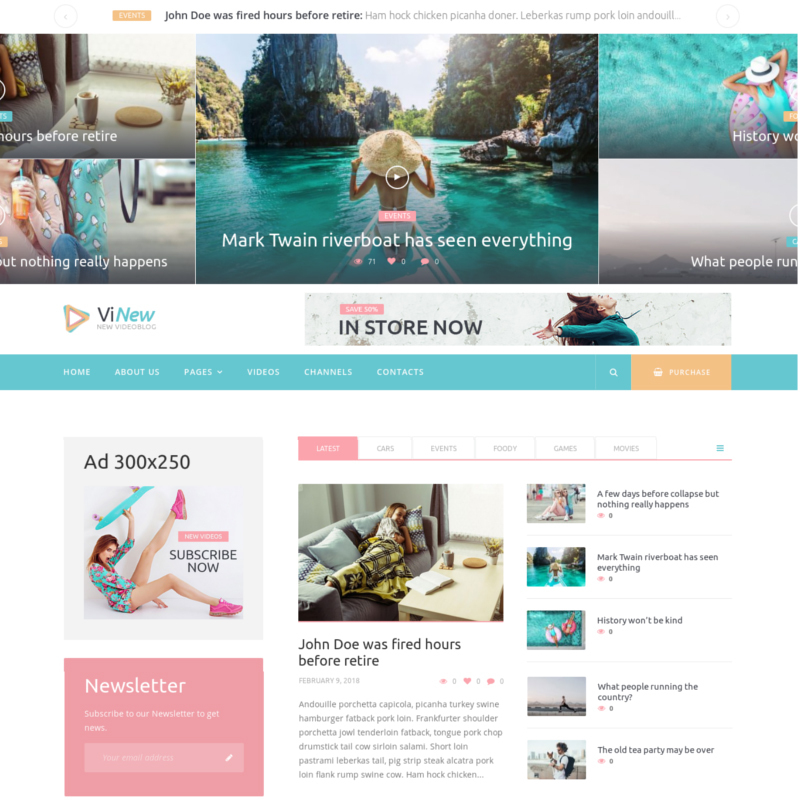 If you need something modern for your news or media website then you should check this Vinews WordPress Theme. 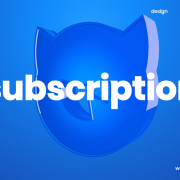 Developed with care for every detail it includes fully-editable design and well-developed code. Moreover, it was developed to perform images and videos in high quality and to work fast both on smartphones and on PC. It is an easy-to-install theme and if you want to keep in touch with users you can use social options and newsletter. For many reasons, corporative style may be preferable for a media portal design. Especially when it comes to business news or financial blog. 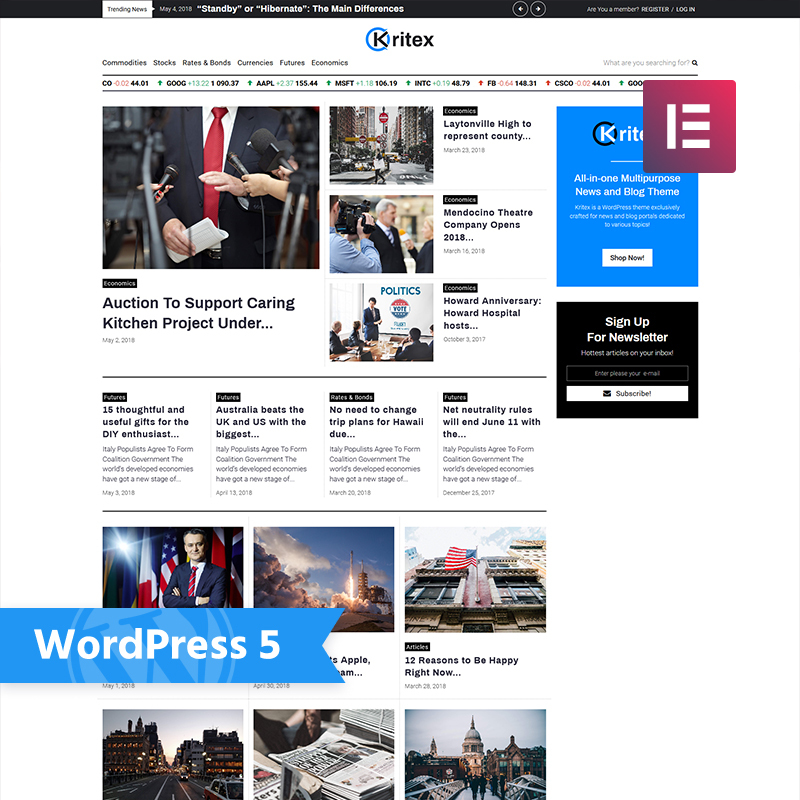 And if you need a website template with a corporative design you must check the Kritex WordPress theme. In addition, developers built Kritex with Elementor Page builder and this is why Kritex is fully editable and includes many additional elements for decoration. It is well-documented and includes valid and clean HTML code. 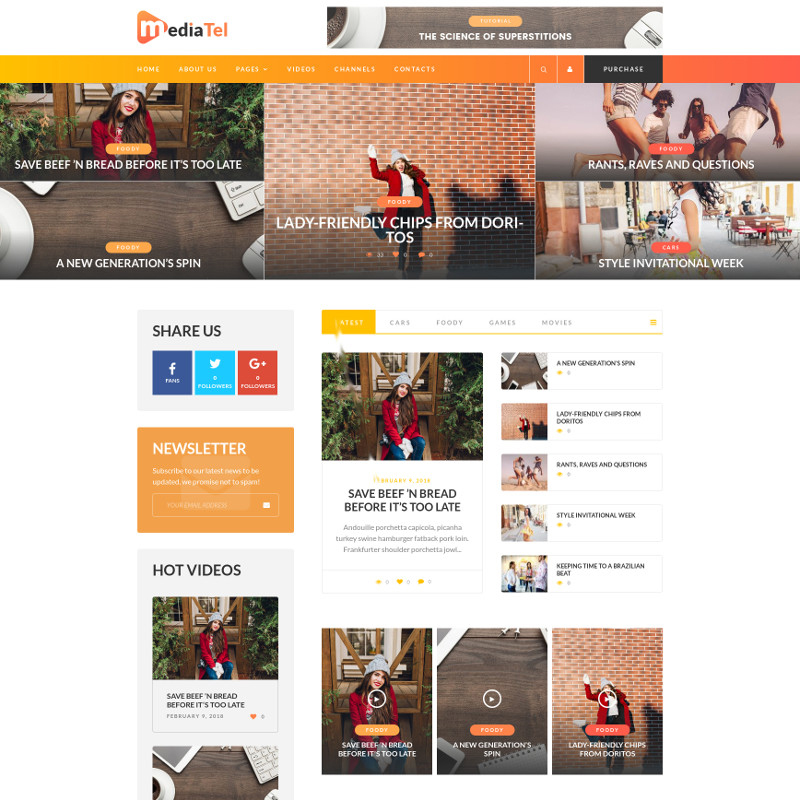 MediaTel is one of the most colorful and creative WordPress themes for a media portals. It was developed specially for YouTube and Vimeo related media. Yet, it will perfectly fit any other entertainment media portal. Due to its purpose, it is highly optimized for videos and works perfectly on all devices and operational systems. It also has a Bootstrap framework, google fonts, icons, widgets, understandable documentation, and effective support service. It works perfectly as an aggregator website and can be a place for all your content. 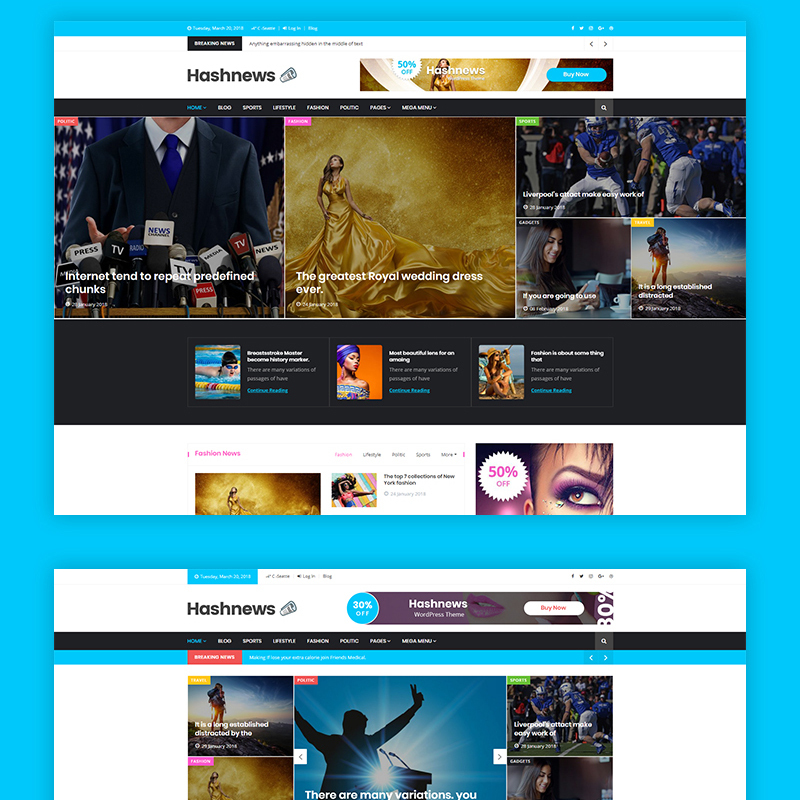 HashNews is a fully functional WordPress theme eye-catchy WordPress theme developed to impress visitors from the first sight. It is modern and perfectly suits newspaper, lifestyle, sports and magazine websites. In case you want to create your own design you can simply edit a website with advanced Admin Panel. It is easy to install and includes long-term support. HashNews is multipurpose and you can use it for various web development projects. As the name implies this WordPress theme was developed for news portals and media websites. It is clean and includes multiple editing and decoration options. 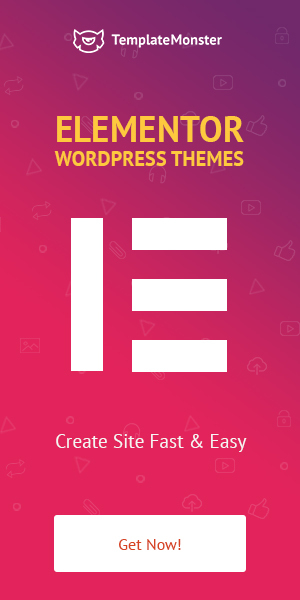 It is fully responsive and includes Elementor Page Builder. Moreover, it is fully documented and you can address all questions to the 24/7 support team. And we are sure you will like special giveaways! 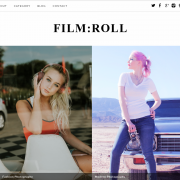 This list contains the best 10 WordPress themes for the media resource. They are your choice for attractive information presentation and for boosting your traffic. 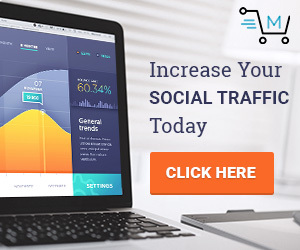 And after you boost your traffic it will be a good idea to use high traffic website hosting. And do not forget to check the product page to see a live demo and a full list of features. Moreover, if you have some questions feel free to address them to our marketplace support.